Mexico’s Humberto Contreras is looking forward to the 2004-2005 figure skating season and a chance to make it to Torino for the 2006 Olympic Games. Mexico’s Humberto Contreras, 21, is looking forward to the 2004-2005 figure skating season and a chance to make it to Torino for the 2006 Olympic Games. “I want to have all my triples and my triple-triple combinations consistently,” Contreras said. “I want to win Senior Nationals for the third time and hopefully go to 2005 Senior Worlds and get a spot at the 2006 Olympics.” Contreras has yet to compete at either Worlds or the Olympics, although he finished 19th at the Four Continents Championships in 2004, up from 21st in 2003. Contreras, who won the Mexican senior title in 2002 and 2003, began this season with a fourth place finish at the Boston Open. 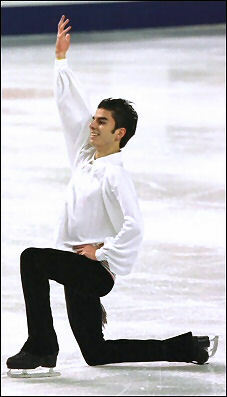 Watching the 1994 Olympics on television was the impetus for Contreras to begin skating when he was twelve years old. Previously, he had tried swimming and baseball, as well as playing basketball, volleyball, and soccer in school. He took to skating immediately, noting, “I love competing and trying new things on the ice.” He landed his first triple within two years and prefers edge jumps to toe jumps with his favorite jump being the triple loop. He currently has a triple salchow-triple loop in his long program and is working on triple loop-triple loop and triple lutz-triple loop. Rocio Salas currently choreographs his programs. He is using Fiesta Flamenca by Salvador Bacarisse for the short and music to the soundtrack of Robin Hood for the long. “I got suggestions from my friends and family,” he said. “After my coaches and I listened to them, we made a final decision. I like to skate to Spanish music, soundtracks and any interesting new kind of music.” Off ice, he enjoys pop music in English and Spanish. His favorite groups are OV7 and Kabah. To relax, he enjoys watching action, suspense and romantic movies and reading mystery thrillers and science fiction. While at home in Mexico, he plays with his French poodle named Doby. He also enjoys chatting, reading emails and downloading music on his computer and has his own website at www.geocities.com/marvinsk8/. Contreras also loves to travel and listed his trip to Hamilton, Ontario, Canada for Four Continents as his favorite trip so far. He wants to see Japan and Australia. Contreras has graduated from high school, where his favorite subject was mathematics. After he finishes skating, he plans to go to college to study marketing and publicity, but he also hopes to coach skating in the future.